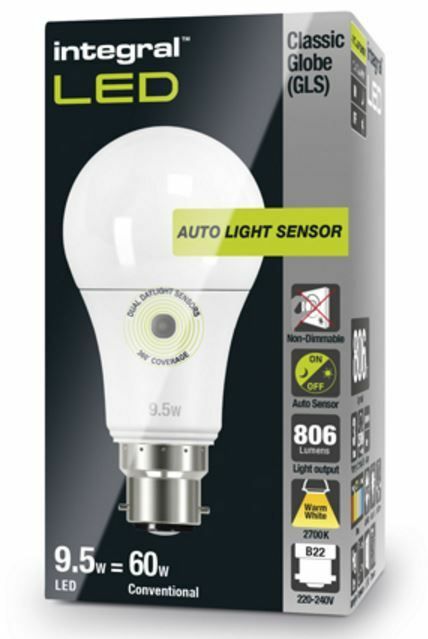 This 9.5W retro-fit Integral LED Auto Sensor Classic Globe (GLS) (large bayonet base) delivers a warm light equivalent to 60W. Because security lighting is on an average of 12 hrs. per day you can save over 30 GBP/44 EUR per bulb, per year on energy. It automatically switches ON at dusk and OFF at dawn, with dual 360 sensors to detect daylight from all angles. Ideal for external porches, walkways, paths and patios. To be used in suitable enclosed outdoor fittings. When ambient daylight intensity is less than 80Lux +/- 30%, LED lamps will automatically turn on; when the ambient daylight intensity is higher than 300Lux +/- 30%, LED lamps will automatically turn off. Not compatible with artificial light sources. This 9.5W retro-fit Integral LED Auto Sensor Classic Globe (GLS) (large bayonet base) delivers a warm light equivalent to 60W. Because security lighting is on an average of 12 hrs. per day you can save over 30 GBP/44 EUR per bulb, per year on energy. It automatically switches ON at dusk and OFF at dawn, with dual 360 sensors to detect daylight from all angles. Ideal for external porches, walkways, paths and patios. To be used in suitable enclosed outdoor fittings.